Gauteng tented camps are an unusual find. These safari-style tented accommodation options clearly challenge the assumption that one needs to leave the city to experience the bush. Gauteng is the smallest province in South Africa. It surrounds the country’s business capital, Johannesburg, and the capital city, Pretoria. On the perimeters of both cities are areas that appear to merge seamlessly with open grasslands, rolling hills and granite rocks that rest on soils more clay than sand, acacia thorn trees the only shade. On summer afternoons, as the heat increases, thunder storms build producing leaden skies both ominous and beautiful. And as the wind begins to blow the storm across the slate canvas, one is treated to displays of lightening as rain spatters. 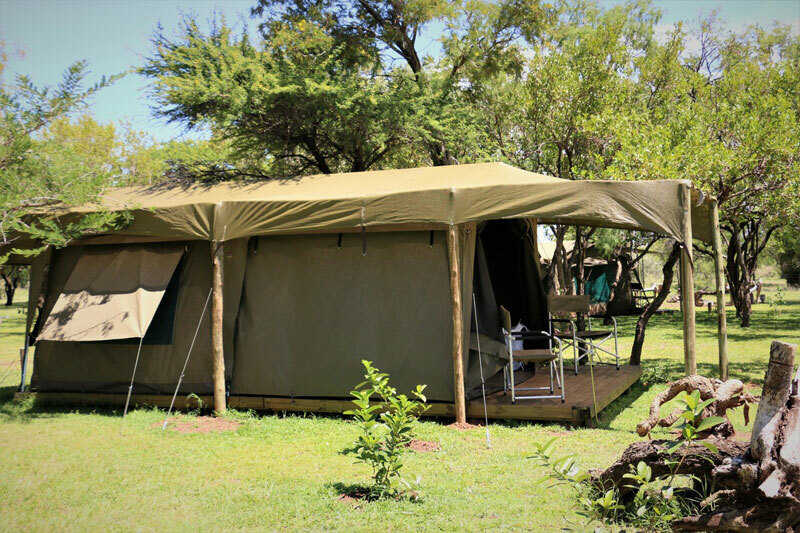 Glamping is the order of the day for the highveld particularly because of its durable all-year blue skied weather. Summer storms are quickly over, leaving the rest of the day perfect for outdoor living. Amazingly, you can find yourself in a 5.5 hectare bush environment right on the outskirts of Johannesburg with all the idyll of a weekend safari bolt hole, yet close enough to the city that you’re in Sandton within half an hour. 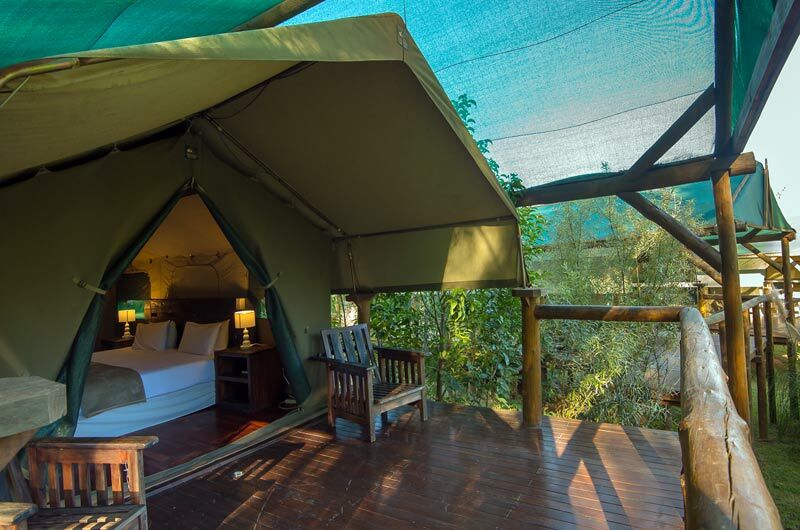 Amadwala offers a raised safari tent, with its own en suite bathroom and wooden deck in amongst the trees overlooking a marshland, with a rich bird life. Highlight: the rates are good value for money. 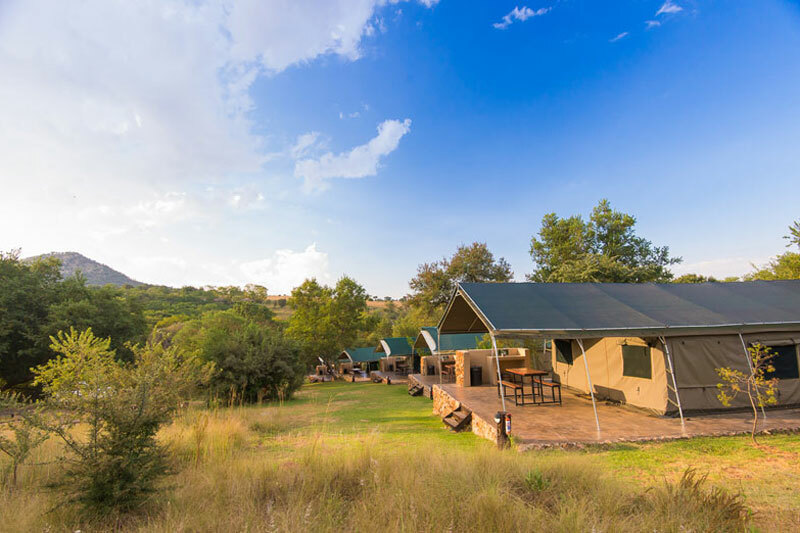 Heads-up for group campers (think: hiking clubs and school outings), Bushwillow Tented Camp is but a half hour from either Johannesburg or Pretoria, making it easy to reach. Set at the foot of the Zwartkops Mountains, on the banks of the Blaauwbank River, the tented camp occupies a section of Glenburn Lodge, with 10 large walk-in tents, sleeping between 4 and 6 people in each (up to 60 people in all). Highlight: a large boma perfect for teambuilding events, river fishing, marked hiking trails into the mountains, horse riding, a heated swimming pool and a field for sport make these Gauteng tented camps appealing for corporate getaways. This 8 bedder bush lodge, just north east of Pretoria, is set on a private nature reserve stocked with plains game and a perennial river that winds through the property. En suite, luxury tents are set under thatch, each on a raised deck overlooking the bushveld. Outdoor showers and a lapa round off the safari theme. Highlight: game drives and sundowners in the bush, drinks around a boma fire and trips to Pilanesberg or Maropeng. Set on a farm on the Pelindaba Road of the West Rand, Stornoway Lodge is not only really close to Lanseria Airport, but its accommodation offerings include a luxury tent overlooking a dam, from which you can watch the sun set, and take en suite showers under the stars. Highlight: the unique tented suite comes with its own sunken bath, there is canoeing, kayaking and fishing on the dam. 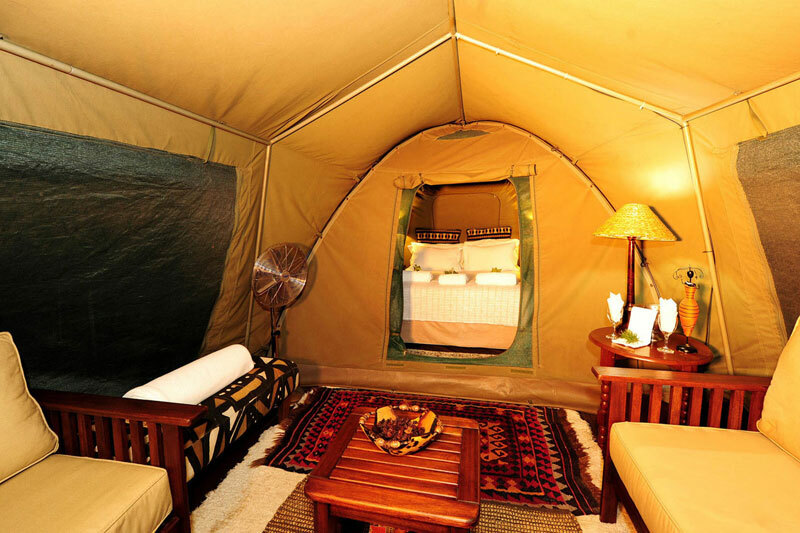 The Safari Tent offers glamping in style! The tent is set on a wooden deck and has a quaint kitchenette equipped for self catering. 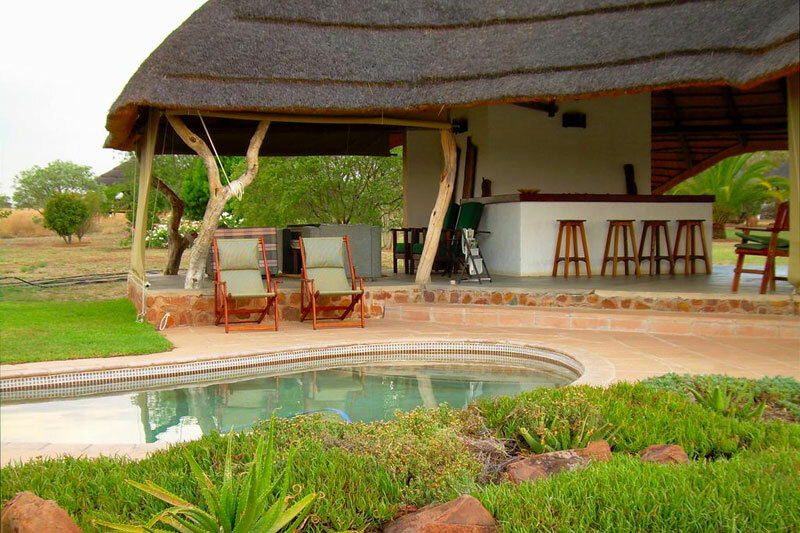 Situated close to Hammanskraal in the Dinokeng Game Reserve, iKhaya LamaDube Game Lodge is just over an hour from Johannesburg, OR International Airport and Pretoria. Set right on the borders of the Dinokeng Big 5 Game Reserve, Thorn Tree Bush Camp is barely 100 km from OR Tambo International Airport. 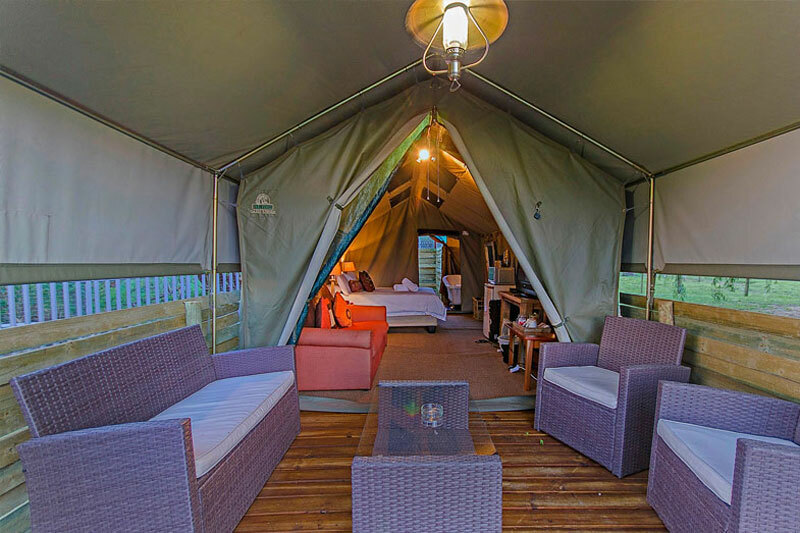 It has a number of safari tent options from a tent in amongst the fever trees, through a family tent overlooking the garden, to a couple of tented camps with their own kitchen area, one with a fire pit. The surrounds are bush wilderness under star strewn skies, similar to that you would expect from the bushveld. Highlight: watering holes on the property for spotting animals.